A young runaway from a slum planet falls in with a gang of thieves who plan to steal a valuable shipment of fuel in order to buy himself a ship and return for the love he was forced to leave behind. 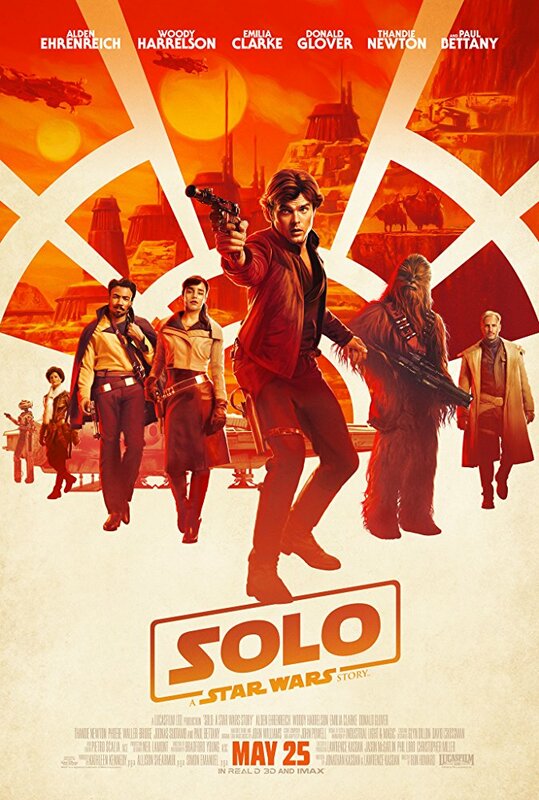 Despite a rather shaky start, the latest spin off from the Star Wars universe is pretty much exactly what I was expecting; a likeable buddy heist movie with plenty of action, gags and fan-pleasing in-jokes along the way.�Alden Ehrenreich is no Harrison Ford but he is okay, although routinely overshadowed by a very strong supporting cast; scene stealing turns by Woody Harrelson as a gun-slinging outlaw and Donald Glover's debonair gentleman thief being the prime examples. It often feels like "Ocean's Eleven In Space", having a similar formula of a likeable ensemble cast within the extended Star Wars universe rather than a true Star Wars film, but I had no problem with that. Slight off notes were the rather clunky opening, the over-egged action scenes within the maelstrom and the revelation of the shadowy villain of the piece which left me feeling rather nonplussed rather than shocked or surprised. But as a whole, Solo is an entertaining blend of action and one-liners that has a vibe that will be familiar to fans of Joss Whedon's Firefly series.